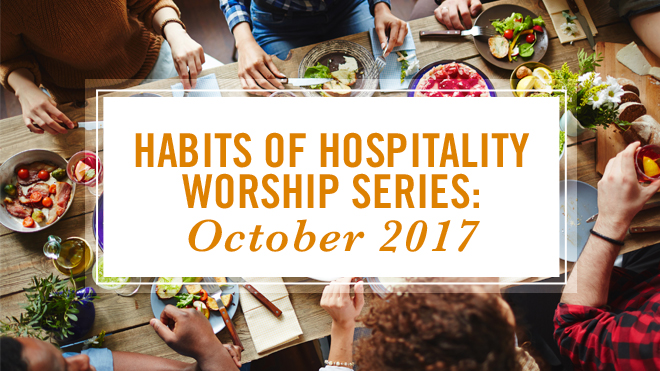 This week’s non-lectionary-based service for Laity Sunday launches a three-week miniseries, “Habits of Hospitality,” in which the succeeding two services are based on the Epistle readings from the Revised Common Lectionary. NOTE: This download will not include hymn suggestions or additional resource links. Those will be added to the website. In this three-week series, the theme of each service builds on the theme of the one before. First, before anything else, and even before we actually meet others, we make it clear we come in peace and offer peace. Second, before we seek to share anything of our own gifts or agenda with others, we seek to receive others and the gifts they bring. Finally, having received others, we share ourselves. This whole process may involve a sense of dislocation and relocation for us in our congregations. As church leaders, lay or clergy, we may think of ourselves primarily as the hosts for newcomers. We think of others as wanting or needing to come to us, as if our primary identity is that we have what they come looking for when they come to us. This is exactly backward of what Jesus says and does in the reading this week, and indeed of the posture of Jesus toward the world. He did not expect others to come to him. He went to them. When he went, he welcomed the people, blessed their children, and brought the hope of justice and healing. Then he invited them to come to him. In this week’s reading, we see Jesus sending disciples just as he himself had been sent by God. Likewise, in Paul’s first letter to the Christians in Thessalonica, Paul writes to others of whom he has first been guest. We, like the disciples and Paul, are those who are SENT to others. WE are the outsiders. Those we meet are the hosts. As you work through this series with your congregation, how might you help dislocate those who may need it into the position where Jesus puts us? And so how might you help them claim the habits of hospitality (or guestitality) Jesus and early Christian leaders practiced as they continued to follow him where he sent?